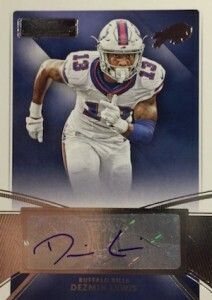 Only featuring autographs, 2015 Donruss Signature Series Football is a hit-focused release that includes former greats, current stars and 2015 rookies. Each hobby box contains four autograph cards. The main set in Donruss Signature Series totals 400 base autographs cards. 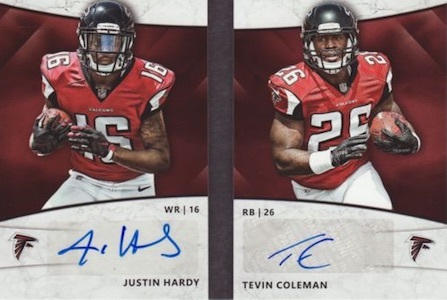 Although the base versions are not numbered, there are limited Gold (#/10) and Magma (1/1) parallels to chase and the checklist includes Hall of Fame versions as well as more recent options including Pro Bowl cards. Rookie Jersey Signature Series takes a look at the newest crop of players with a horizontal deign, autograph and jersey swatch. Prime (#49 or less) and Super Prime (1/1) parallels offer quality patches. 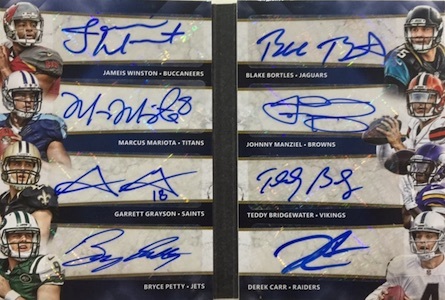 Additionally, collectors can find several multi-player autographs, which are also a case hit. GR8S celebrates the eight greatest players at quarterback, running back or wide receiver on one card. 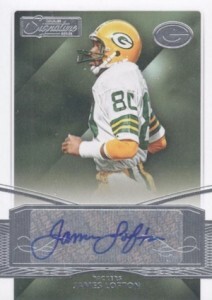 There are also Signature Booklet Series cards that contain two, four, six or eight autographs. 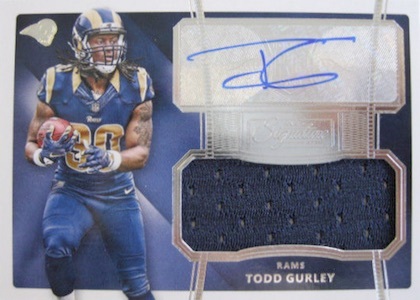 Every hobby box features one Rookie Jersey Signature or multi-player autograph. TITUS DAVIS 2015 DONRUSS SIGNATURE SERIES RC AUTOGRAPH AUTO #416 3 10 SP! 5 cards. Serial numbered #/4. 4 cards. Serial numbered #/3. 3 cards. Serial numbered 1/1. Let’s be real and call this product for what it is: A dump off for excess Auto-Stickers that were collecting dust in the vault. The 400 card base set is ludicrous and is stocked with rubbish. Yes, there are notables and big name current stars and HOF autos BUT you cannot hide the fact that the likes of Ben Tate, Montee Ball, Kembrell Thompkins, Vinny T, Trent Dilfer and other irrelevants are checklisted; all of whom have no business being in a 2015/2016 product. After participating in 2 case breaks of this product there is simply not any value in 80% of the boxes due to the aforementioned issues. Most boxes would not even come close to the $120 price point.Some boxes were outright atrocious with 4 cards that wouldn’t get a $0.99 starting bid on eBay. I would recommend to stay away from this product until it’s price drops significantly under $80; which it will. Wow this is the worst product I have seen overall in a long time. Stay away from it the price is very bad and the outcome of opening the boxes is just not worth the money or time. The cards are very very cheesy and every auto is sticker so theres nothing to look forward to. Participated in a case group break and was very disappointed in the quality of players pulled. Honestly I can’t remember the name of a single player as part of the nine cards I received – perhaps they are members of practice squads? I could not agree more with the above reviews and would also NOT recommend this product until the price is significantly reduced, Better yet, look elsewhere for much better value for your hard earned dollars. I got a box and one of the cards was a Chris Borland numbered 7/10. This play retired after one season in March of last year. What business this player has a card in a product released ten months later is beyond me. Won’t ever buy another Panini product ever again. Even though there are a lot of autos from irrelevant players, there are also a ton of great gems for fans. Where else can you find a auto of ricky williams in a saints uniform. The patch auto’s aren’t the greatest, but the amount of legends make up for it. A decent looking set, but filled with 90% fluff. The value doesn’t hold up to the current market…. I have only opened 1 box so far at the now $50 per hobby box price point. I pulled a Frank Tarkenton auto and a David Johnson RC auto Patch. I think it is a great buy at the price poin now.